NOTE: Might be worth talking to someone from MIT’s Center for Advanced Urbanism, or an editor from City Lab or Next City for suggestions of additional “downtown” indicators and possible data sources, as well as more forecast data, which is quite lacking in this round-up. The U.S. Geological Survey tracks and forecasts several categories of land use, with charts and maps showing change under four different scenarios from 1992 through 2100. The land-use categories include acreage that is 1) urban/developed, 2) forest, 3) cropland, 4) grassland/shrubland, 5) hay/pasture, and 6) wetland. Researchers at the USGS Earth Resources Observation and Science Center have developed the FOREcasting SCEnarios of land-cover change (FORE-SCE) model that is based on consistent and systematic historical data derived from Landsat satellite imagery of rates and spatial patterns of land cover change over many years. As part of USGS research to assess potential greenhouse gas fluxes and carbon storage in vegetated landscapes, FORE-SCE has been used to produce projected, annual land-cover maps from 1992 through 2100 for four future scenarios for the conterminous United States. The land cover maps provide 250-meter resolution information for 17 different land-use and land-cover classes, offering an unprecedented combination of thematic detail and spatial resolution for land-cover projections. The four land cover scenarios that were modeled are based, in turn, on carefully-defined environmental scenarios from the Intergovernmental Panel on Climate Change (IPCC), ensuring that the projected land cover maps may be used in assessment frameworks consistent with IPCC scenario characteristics. The scenarios vary in terms of both climate and socioeconomic conditions in the future. The A1B scenario is characterized by very high economic growth, strong technological innovation, and open, global economies and societies. Projected land use changes include sprawling urban growth, agricultural expansion, and heavy use of forested lands for wood products. The A2 scenario is characterized by moderate economic growth, very high population growth, and less open economies and societies. Land use changes include very high urban growth, massive expansion of agricultural lands to feed a growing population, and loss of natural landscapes. The B1 scenario has high economic growth, moderate population growth, and a focus on environmental sustainability. 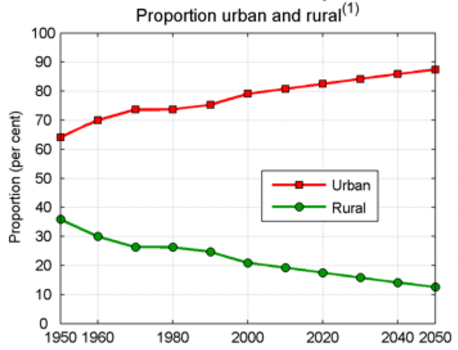 Land-use change is modest, with compact urban growth and modest increases in agricultural land. The B2 scenario has moderate economic growth, low population growth, and a focus on environmental sustainability. Natural landscapes are preserved and even expanded in this scenario, with a reduction in lands devoted to agriculture. Terry Sohl, et al. December 2012. TO DO: CONTACT TERRY SOHL, sohl@usgs.gov, FOR DATA POINTS. MIGHT BE AVAILABLE VIA ONE OF THE (HUGE) EXCEL FILES ON THIS PAGE. The Lincoln Institute has also projected urban land coverage based on a 1990-2000 sample of 120 global cities. Three projections are made based on three different assumptions about density change over time: (a) no density change; (b) a 1 percent annual density decline; and (c) a 2 percent annual density decline. Shlomo Angel, et al. 2010. Atlas of Urban Expansion. Lincoln Institute of Land Policy. 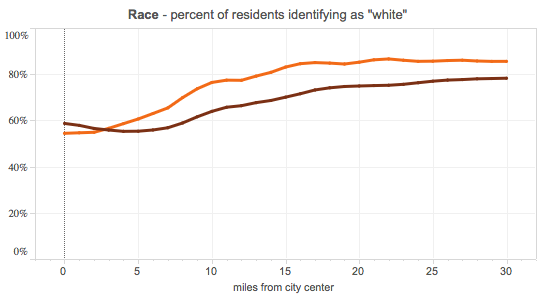 Demographia.com, maintained by Wendell Cox (a pro-automobile urban planner who favors low-density planning), has aggregated a few urbanizations statistics from the US Census Bureau. 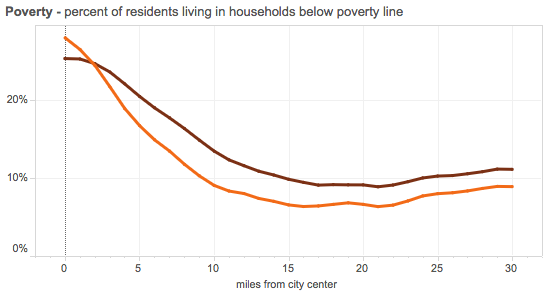 Indicators include urban land area (square miles), urban population, urban households, population density, and household density, as well as annual percent change for all of the above. Decadal data points are available from 1950 through 2010. 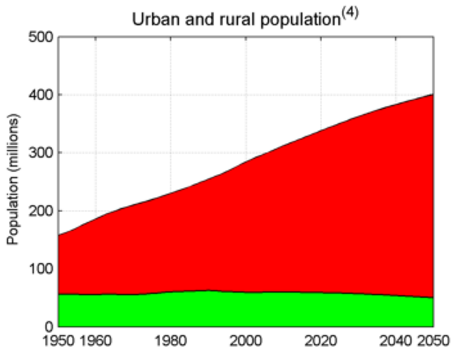 Proportions of urban and rural population in the current country or area in per cent of the total population, 1950 to 2050. 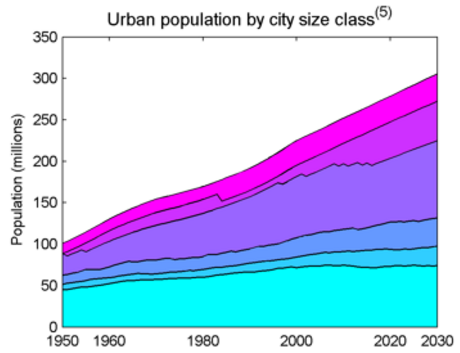 Urban population of the current country by size class of its urban agglomerations in 2014. 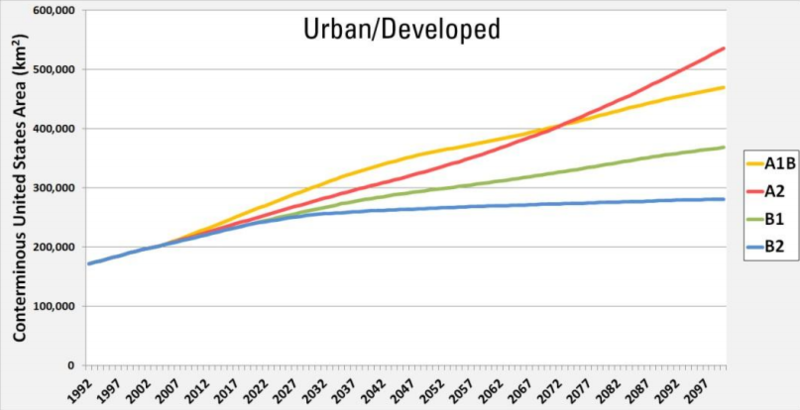 “Country Profile: United States of America,” in World Urbanization Prospects: The 2014 Revision. Department of Economic and Social Affairs, Population Division. TO DO: EXTRACT DATA. ANNUAL DATA AVAILABLE HERE. Luke Juday. Accessed August 19, 2016. University of Virginia. Demographics Research Group. 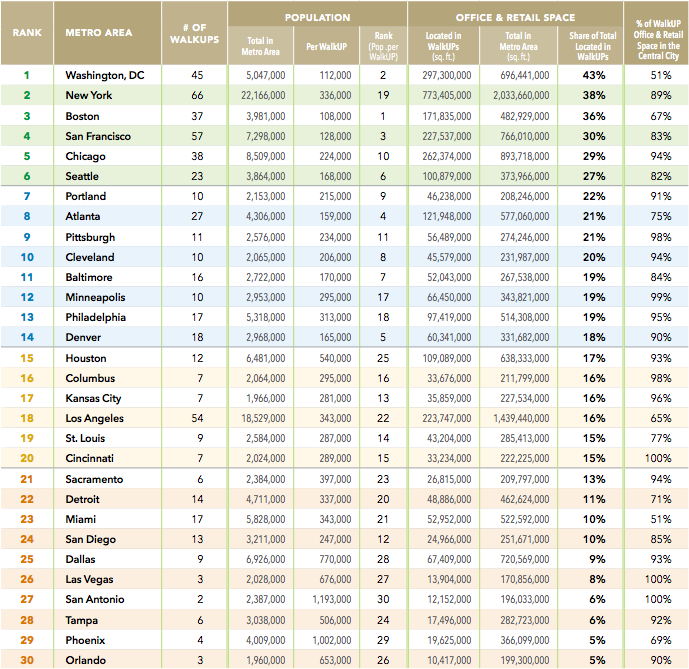 Based on the Census Bureau’s data for the 51 major metropolitan areas (those with more than 1 million population). US Census Bureau. September 2012. 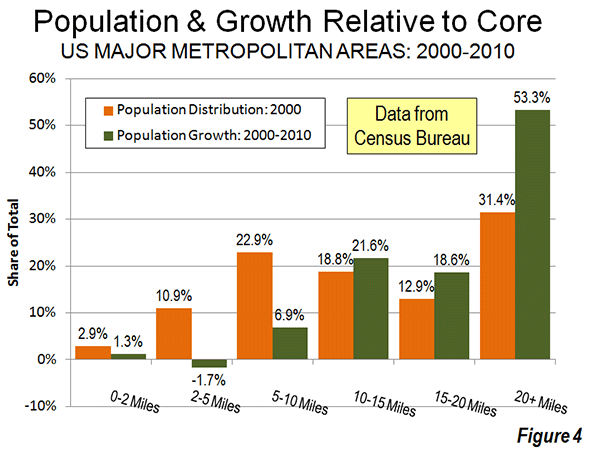 City Observatory analyzed Census Bureau data from the 2002-2007 period to the 2007-2011 period and finds that after a long period of decentralization, economic and demographic indicators are now favoring city centers. When we compared the aggregate economic performance of urban cores to the surrounding metro periphery over the four years from 2007 to 2011, we found that city centers—which we define as the area within 3 miles of the center of each region’s central business district—grew jobs at a 0.5 percent annual rate. Over the same period, employment in the surrounding peripheral portion of metropolitan areas declined 0.1 percent per year. When it comes to job growth, city centers are out-performing the surrounding areas in 21 of the 41 metropolitan areas we examined. 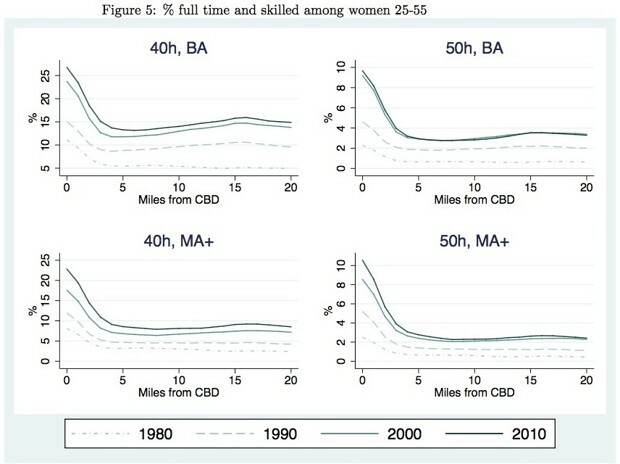 This “center-led” growth represents the reversal of a historic trend of job de-centralization that has persisted for the past half century. Economists at Columbia University and the Getulio Vargas Foundation have also analyzed Census Bureau data from 1980 to 2010, finding that center cities and downtown living are making a come back. Their analysis is based on data from 27 heavily populated U.S. cities, from the CBD to 35 miles away from the center of the cities. Their report includes an interesting graphic on skilled jobs, although these are not the exclusive focus of the report. 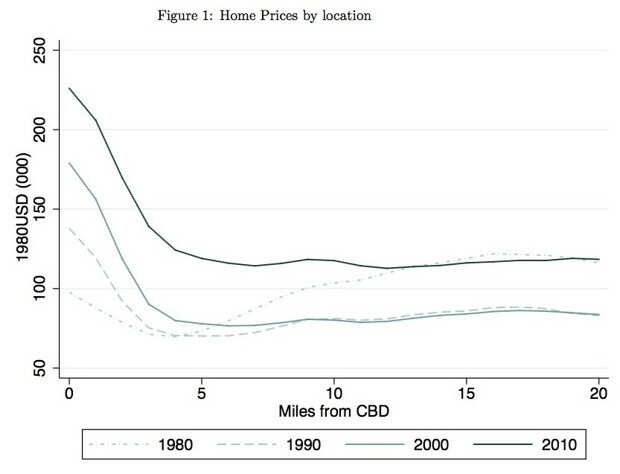 Elsewhere in this roundup, I’ve also excerpted a graphic for home prices and and education which follow the same trend. Lena Edlund, et al. 2015. National Bureau of Economic Research. 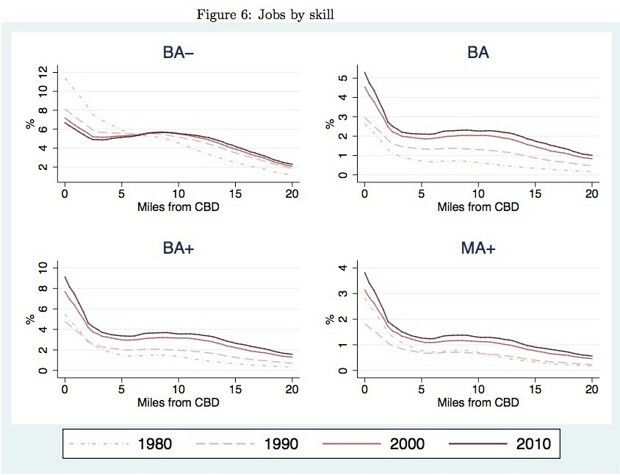 NBER Working Paper No. 21729. The data for men show similar trends, with shares rising a bit more toward the periphery. In City Observatory’s analysis of 2002-2007 and 2007-2011, referred to above, they also came up with a competitiveness calculation which favors city centers. We undertook a shift-share analysis that allowed is to separate out the effects of changing industry mix from relative competitiveness. 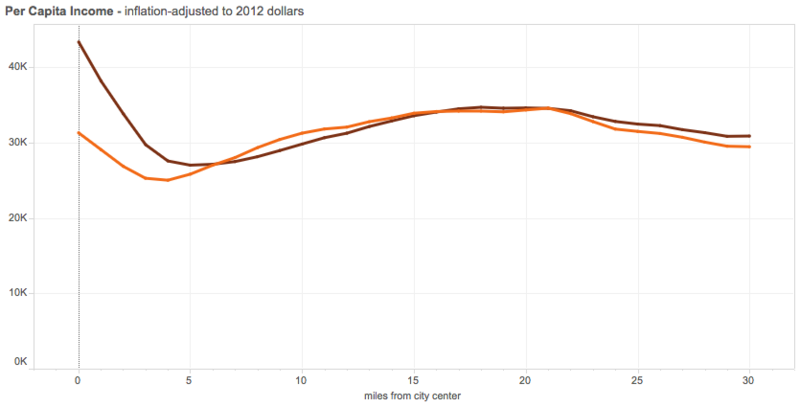 The data make it clear that city centers are more competitive in 2011 than they were in 2007. 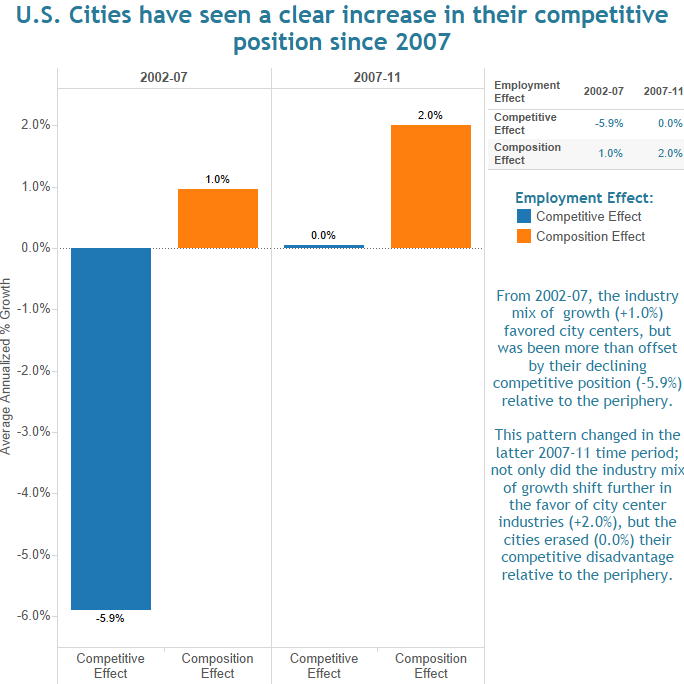 While city centers had a negative competitive effect in the 2002-07 period, their relative competitiveness for industry has been equal to peripheral locations from 2007-11. Researchers at The George Washington University School of Business identified and analyzed 558 walkable urban places (WalkUPs) in the 30 largest metropolitan areas in the United Station, and then ranked the 30 metros according to their current walkable urbanism. This research, published in 2014, is an update to the Brookings Institution’s initial scoring in 2007. 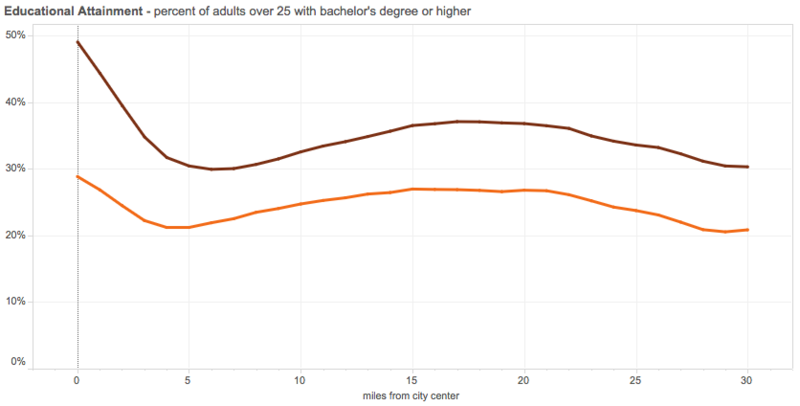 The researchers find that the most walkable urban areas are correlated with substantially higher GDPs per capita and percentages of college graduates over 25 years old. They also find that walkable urban office spaces command a 74% rent-per-sq-foot premium over rents in drivable suburban areas. 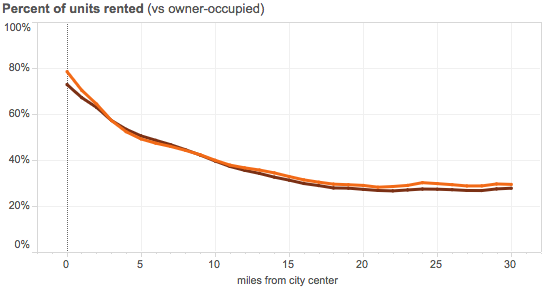 They assert that walkable urban development is not limited to center cities, but includes the urbanization of suburbs. They predict future demand for tens of millions square feet of walkable urban development and hundreds of new WalkUPs. 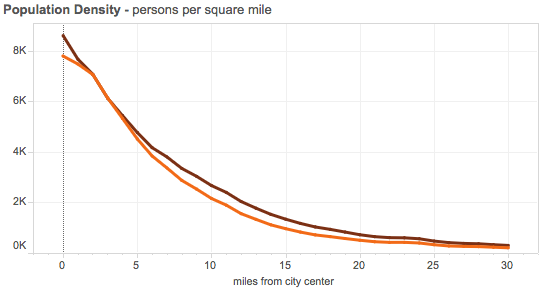 Walkable urban places are defined as having 1.4 million square feet or more of office space and/or 340,000 square feet or more retail space, as well as a Walk Score value greater than or equal to 70 at the 100 percent location of the WalkUP. 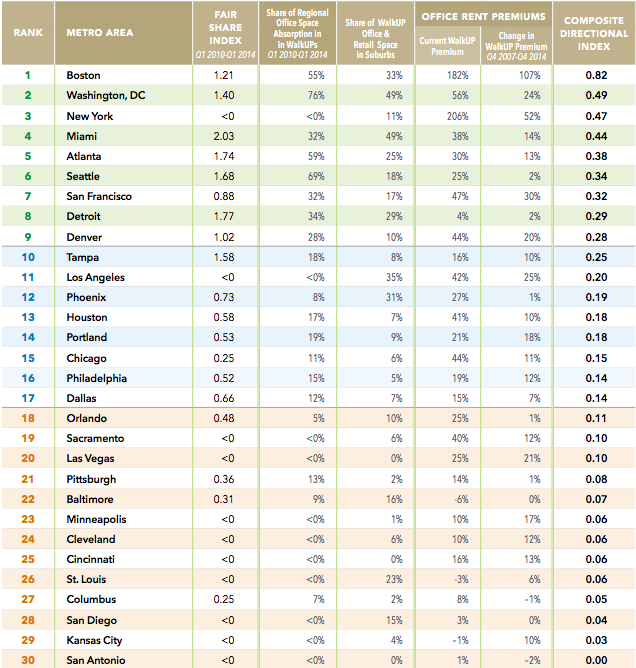 Note: This ranking refers to the level of expected future walkability, but does not define a particular point in time in the future. Although there are only 6 metro areas currently ranked as highly walkable, 9 are expected to be highly walkable in the future. Christopher B. Leinberger & Patrick Lynch. 2014. The George Washington University School of Business. 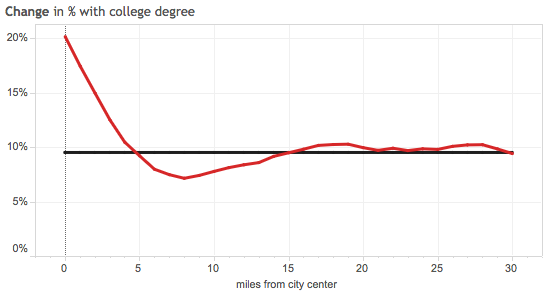 The University of Virginia’s Demographics Research Group has analyzed the demographic trends of 66 major US metropolitan areas with regard to their distance from the city center. 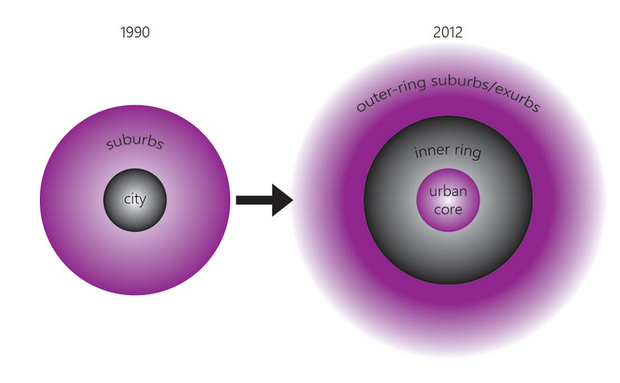 City Lab reports that, in many cases, the findings help to support Aaron’s Renn’s “new donut” model of cities, although some cities continue to follow other growth models, referred to as “magnetic” cities and “old donut” cities. 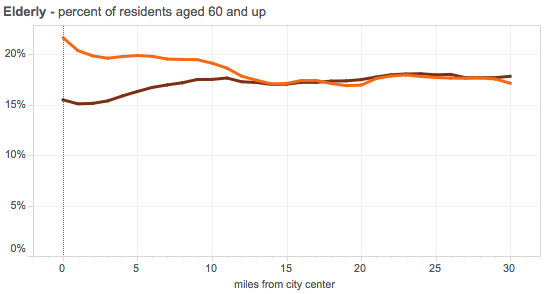 In the “old donut” model, growth and wealth are concentrated in the suburbs. 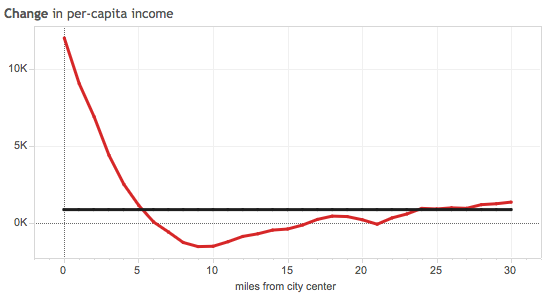 In the “magnetic” model, growth and income are highest in the center and gradually decline all the way to the periphery. 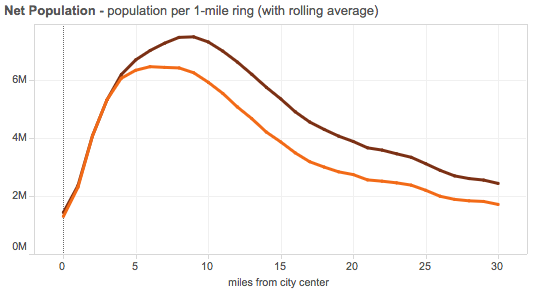 In the “new donut” model, city centers and outer-ring suburbs have the highest performing indicators, but the inner ring suburbs are characterized by decline. University of Virginia. Weldon Cooper Center for Public Service. The University of Virginia also released a charting tool associated with their report. In addition to showing charts for individual cities, it also includes charts for a composite of the 50 largest metropolitan areas. The charts below (also excerpted elsewhere in this roundup) show the “new donut” model. 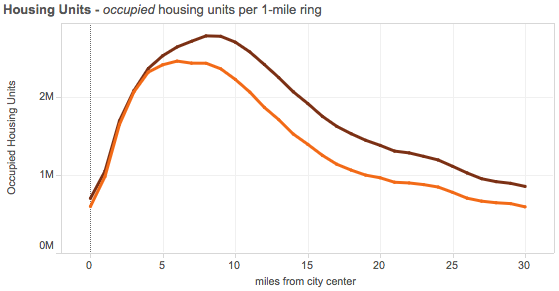 A US Census Bureau report from 2012 also shows a “new donut” model of population change for the period 2000-2010, although Wendell Cox argues that the growth in city centers is over-exaggerated. 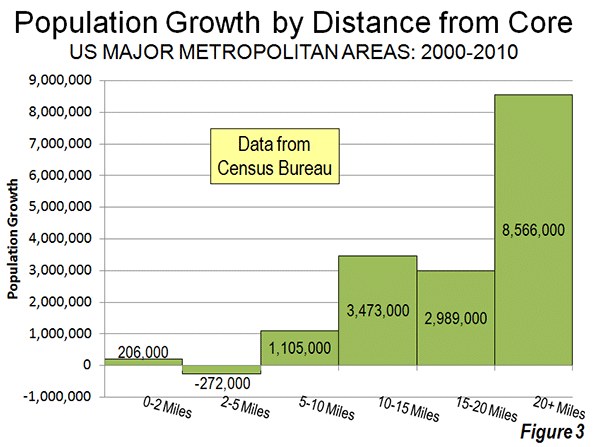 Cox created the following graphics (also excerpted above) based on the Census Bureau’s data for the 51 major metropolitan areas (those with more than 1 million population). Cox puts it this way, and it’s true, based on the data: “The one percent flocked to downtown and the 99 percent flocked to outside downtown.” The literal figures are 1.3% and 98.7%. Amanda Kolson Hurley. June 6, 2016. Somewhat critical review of the MIT Center for Advanced Urbanism conference on suburbs, spring 2016. 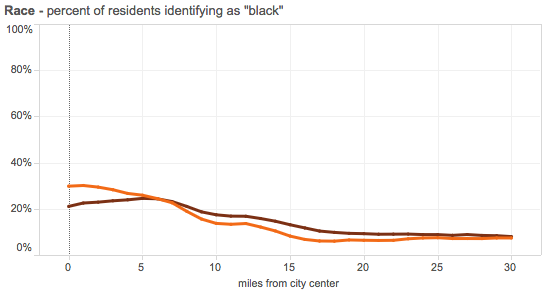 Lists a few other centers and researchers examining suburbs. Not a lot of data sources though. Here’s a news article from MIT promoting the conference. Vision of the future of cities as impacted by driverless cars. Very short. The elderly, young, and disabled will be more mobile. Parking lots could be turned into green spaces, or offices or housing. 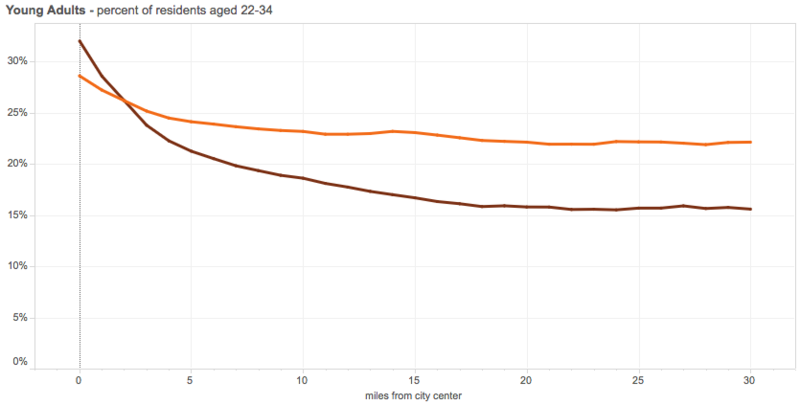 People might spend less time commuting, or they might commute farther. Downtowns AND distant villages could both become more appealing.